Noel is one of the best drummers that Ireland has ever produced. He started playing with Skid Row: Phillip Lynott on vocals, Brush Shiels on bass, Gary Moore on guitar. Noel has played and recorded with artists such as Mary Black, Mike Scott and the Waterboys, Jackson Browne, Sharon Shannon, Steve Earle, Christy Moore, Van Morrison, Mick Hanley, Donal Lunny, The Corrs, The Chieftains and Paul Brady. Apart from his ability as drummer and percussionist, Noel is a very distinctive singer. His funky, unique and very soulful interpretations of blues, rock and soul classics are a must hear for any fan of these genres. Ed Deane guitar and vocals. Ed started playing guitar and slide guitar while still at school. Age sixteen he formed Blueshouse and played alongside visiting American blues artists such as, Champion Jack Dupree, Johnny Shines, Mississippi, Fred Mac Dowell and Juke Boy Bonner. He played with Granny’s Intentions and the Woods Band. Moving to London, he played with Bees Make Honey, recording an album with them produced by Nick Lowe. After a spell in France, he joined Frankie Miller Band, touring Europe and the US. In the eighties he wrote soundtrack music for Stormy Monday and Leaving Las Vegas. In the 90’s he recorded and toured with Chris Jagger, Nick Lowe, Bap Kennedy and Dana Gillespie. Since returning to Ireland, he has released two albums – Slideshow (all instrumental) and Wireless (a mix of instrumental and vocals). He also recently toured with Donovan. Tommy has been playing bass and singing in bands since the 1970’s. 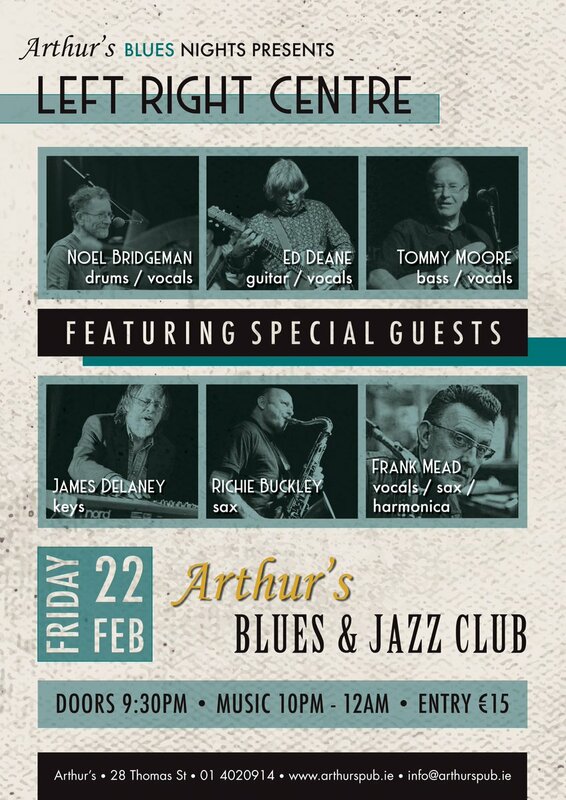 He hails from a family of famous Irish and now internationally renowned musicians; Butch Moore, Des Moore (the premier session guitarist in Ireland since the 1960’s), his daughter Gwen has a Phd in Music Education, his nephew Paul Moore, bassist with Van Morrison, his grand nephew, Jake Curran, guitarist with Niall Horan. 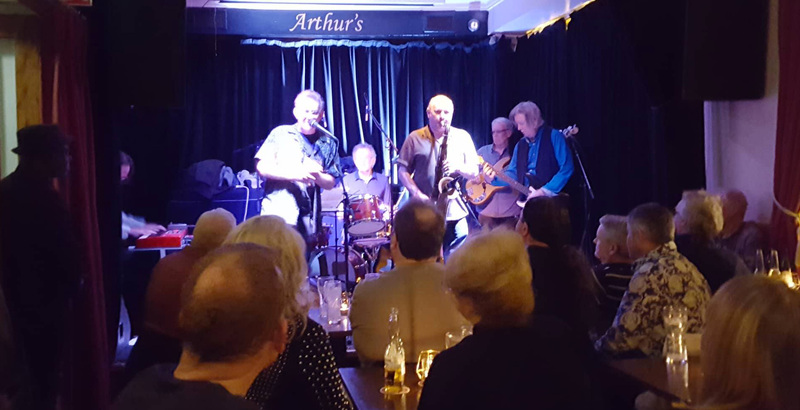 He has been involved with artists and bands such as: The Vampires, The Strangers, Stagalee (a founder member along with Errol Walsh), Pat Farrell and Don Baker in blues outfit ‘The Business’, played bass on Paul Brady’s first electric album ”Hard Station”, and toured with Brady. Played bass on the Johnny Logan Eurovision winner ”What’s Another Year”. Played bass in the original Irish production of ”Jesus Christ Superstar”. Other associations include: The Fleadh Cowboys, Mary Coughlan, Christy Moore, Bill Whelan (Riverdance), Ronnie Drew, Philip Donnelly, Scullion (Balance and Control, Prod. John Martyn), Greg Boland, Jimmy Faulkner, Mick Pyro, Anto Drennan, Myles Drennan. He has done numerous studio and RTE sessions as a bassist and backing vocalist. While involved with all of this, he taught Bass and Aural skills in The Senior College, Ballyfermot for 25 years. He is also lead vocalist and bassist with his band ” Badge”, and is bassist and vocalist with the Steely Dan tribute band ”Aja”. Richie has long been recognised on an international level as one of the finest jazz musicians of today. His performing credits include Van Morrison, Freddie Hubbard, Dave McForKenna, Jiggs Wigham, Bob Dylan, Georgie Fame, Carlos Santana, Elvis Costello and many more. Frank has often been seen on stage in Gary Brooker’s company. He’s a long-standing contributor to No Stiletto Shoes and to Bill Wyman’s Rhythm Kings, in both of which ensembles he has of course played A Whiter Shade of Pale along with other occasional Procul Harum/Brooker pieces. He’s recorded with people such as Manfred Mann, Maxi Priest, Gary Moore, Five Star, Dave Knopfler, Paul McCartney, Squeeze, Paul Young, Big Town Playboys, Bill Wyman, Go West and Beverley Craven. James Delaney was the keyboard player of choice for most discerning musicians and bands in the rock scene in Dublin in the seventies and eighties. Bands like Stagalee, Rob Strong & the Rockets and the Red Peters blues band were quick to snap up such a precocious and exciting young talent. His career and reputation hasn’t slowed down any since then and he remains the go-to keyboard player for individuality, creative flair, a great groove, an intimate acquaintance with a wide range of musical styles – all delivered with real panache and ‘character’. James has been described as ‘eccentric’ by some, a euphemism which covers a lot of territory! But his focus is always on the music and he generally eschews most modern distractions which aren’t strictly relevant and which he considers a waste of time, like social media.